Last week's unanimous vote against war with Iran was good news, largely ignored by the press. Many questioned the veracity of the story. It's up to us to substantiate Congressional admonition for peace with demonstrations of resistance to U.S. military intervention. Let's work to create the kind of political situation that forces an end to the Trump/Pence war on humanity. The House amendment to the National Defense Authorization Act of 2019 (H.R. 5515) revokes statutory authorization to go to war with Iran, reports Truthout contributor Marjorie Cohn. Passage represents an important move by Congress to reassert its authority to declare war. But it fails to address War Powers Resolution loopholes contained in the 1973 Act; the president can still launch an attack under ambiguous circumstances: "a national emergency created by attack upon the United States, its territories or possessions, or its armed forces," or when there is "specific statutory authorization," like Trump's targeted killing rules for hunting suspected terrorists. "Although the Ellison amendment states that no statute authorizes the use of U.S. armed forces in Iran, it does not prohibit the expenditure of money to attack Iran," adds Cohn. "Nor does it proscribe the use of sanctions against Iran (Journalist Fariba Pajooh testifies to the human cost here)." 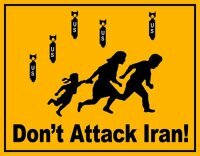 We must remain vigilant against backdoors to war such policies provide, warns National Iranian American Council (NIAC) Action director Jamal Abdi. "This amendment sends a powerful message that the American people and Members of Congress do not want a war with Iran. Today, Congress acted to reclaim its authority over the use of military force," said amendment author Keith Ellison in a press release. Whether the message from American people gets heard depends on you.